The Top 25 Most Valuable Pennies | Which Old Pennies are the most Valuable? Want to know what the most valuable pennies are? At Coin Values, we are always staying on top of the latest changes in coin prices, and we have a list of the top 25 most valuable pennies. Small cents, by the way, are 19.1 millimeter diameter pennies that have been produced by the United States Mint since 1856. Do you have any of these coins in your penny jar? It may be worth taking a look, because many of the most valuable pennies on this list were made in the 20th century. It’s possible these coins may be hiding in the basement, inside an attic box, or even inside your penny jar. 1943-S copper Lincoln Wheat Penny, $185,000 – The 1943-S copper cent is the one of the most valuable small cents, with one example having sold for a cool $1 million at an auction in 2012. The story behind copper 1943 Lincoln Pennies is presumed to be a pure accident at the U.S. Mint – perhaps a few leftover copper planchets from 1942 were stuck in the coining press system and struck with 1943 penny dies. Whatever the origin of the 1943 copper pennies, they are considered by the Professional Coin Grading Service to be the “most desirable and valuable of all Mint errors” and are highly sought-after by U.S. coin collectors. 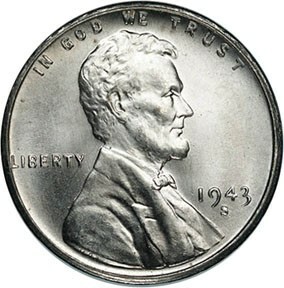 1944 Steel Lincoln Wheat Penny, $125,000 – It’s believed that a similar story behind the creation of the 1943 copper cent is also what led to minting of the 1944 steel penny; blank steel cent planchets from 1943 that were hiding away in the coining presses wound up getting stamped with the 1944 dies, and the result is a rarity that financially well-heeled coin collectors will pay hundreds of thousands to buy. 1943 copper Lincoln Wheat Penny, $45,000 – A Philadelphia Mint version of the 1943 copper penny may not be worth quite as much as a San Francisco Mint or Denver Mint example in Extremely Fine grade on the Sheldon Grading Scale, but it’s a rare coin nevertheless. It’s believed that less than 30 copper 1943 pennies exist from across all three mints (Philadelphia, Denver, and San Francisco) operating at that time. 1856 Flying Eagle penny, $12,850 – Only 2,000 examples of the Flying Eagle cents were ever made. Why so few? Actually, 1856 Flying Eagle pennies were made as a pattern coin, and while many of them circulated, the series wasn’t intended to be produced on a mass scale yet – not until 1857, anyway. Even for an example in a lowly grade of Good-4 on the Sheldon Grading Scale, 1856 Flying Eagle pennies are valued at about $7,000! 1969-S doubled die obverse Lincoln Memorial penny, $10,000 – Doubled die coins have to be one of the most popular error coin varieties out there. The 1969-S (San Francisco Mint) is no exception, and it’s not only one of the most expensive small cents, but also the priciest among the Lincoln Memorial series. Be sure to check your change for this one! 1877 Indian Head penny, $2,650 – Unlike the first five pennies listed in this article, the 1877 Indian Head cent isn’t any type of error or pattern coin. It simply is a regular-issue piece that was struck in relatively low numbers. In fact, only 852,500 were originally minted, and only a small fraction of 1877 pennies from the original mintage remain today. 1873 doubled Liberty “closed 3” Indian Head penny, $2,400 – Another doubled die cent, this piece features doubling in the word LIBERTY. A doubled die coin of any era is usually pretty scarce to begin with, but an Indian Head cent is scarcer still. The closed 3 is especially rare because only a tad more than 1 million 1873 cents of this variety were made, whereas about 11 million “open 3” cents were made. 1922 No D plain Lincoln Wheat Penny, $2,050 – Repairs to a damaged coin die left the 1922-D cent without any visible trace of its mint mark, leaving a coin that many thought back in the mid 1920s was a typical unmarked penny from the Philadelphia Mint. It was soon learned that only the Denver Mint struck pennies in 1922, and one-cent coins without a mint mark but bearing that date were in fact mistakes. Perhaps 15,000 to 20,000 plain 1922 Lincoln Cents were made, but nobody knows the exact number of examples that were made, let alone how many remain to this day. However, what is known for sure is that the 1922 no-D penny is quite scarce and in high demand among coin collectors. 1955 doubled die obverse Lincoln Wheat Penny, $1,900 – It’s estimated that some 24,000 Lincoln Cents from 1955 were struck with a doubled die. The U.S. Mint knew this before the coins were released to the public, but officials didn’t want to destroy an entire batch of perfectly normal Lincoln Pennies to catch the ones with the doubled image, so off these beauties went, and soon they were discovered in New England vending machines. By the end of the 1950s, they had become a hot coin collector item and remain so to this day. 1873 doubled Liberty “Open 3” Indian Head penny, $1,650 – This is simply another version of the 1873 doubled die Indian Head penny. The difference between this 1873 penny and the closed 3 listed above is the way the serifed ends of the 3 come near the middle of the digit. On closed 3 examples, it appears that the “3” has two nearly complete loops, whereas on the open 3 there is much more space between the ends of the “3” and the digit’s middle section. As a rule, 1873 open 3 Indian cents are more common than the closed 3 variety. *This list of most valuable pennies refers to problem-free coins grading Extremely Fine-40 on the Sheldon Grading Scale. Damaged coins or those grading lower based on wear will be worth less than the coin values listed above. Are The 25 Most Valuable Pennies Also The Rarest? While the two most valuable coins on this list are coincidentally the rarest (between 20 and 40 specimens each of the 1943 bronze cent and 1944 steel cent are thought to exist), the order of which coins are most valuable doesn’t necessarily correspond with the order of rarity. For example, many of the doubled die entries on the list above (such as the 1971, 1972, 1983, and 1984 doubled die Lincoln cents) are much scarcer in number than the 1877 Indian Head cent or 1914-D Lincoln cent, but are not as widely collected, thus the values of those somewhat more obscure coins are lower. While mintage numbers tell part of the story about a coin’s rarity, they don’t show you a complete picture. Remember, a substantial fraction of the coins that were once minted no longer survive today, as many have been lost, melted, or damaged beyond recognition. Take, for instance, the popular 1909-S VDB Lincoln cent. While 484,000 were struck, several population estimates suggest only 50,000 to 100,000 may still exist – a fairly large number indeed, but much lower than mintage numbers suggest. Whether you collect Flying Eagle pennies, Indian Head pennies, or Lincoln pennies, you will find that the market for rare pennies is quite active. If you are investing money in rare pennies, buy coins that are in the best condition you can afford, and always focus on purchasing coins that display original color and are in nice shape overall. While there are very few guarantees in the rare coin industry, you can always count on nice, problem-free coins yielding better returns on your investment than coins that have been cleaned or have nicks, dents, scratches, and holes.